Each year in the United States, complications related to anesthesia are listed as the underlying cause of approximately 34 deaths, and cited as a contributing factor in another 281 fatalities. The data was gleaned from a comprehensive, seven-year study published in the medical journal Anesthesiology and posted online by the U.S. National Library of Medicine. Overall, 46.6 percent of the deaths were attributed to an overdose of anesthetics, followed by 42.5 percent who were killed by the adverse effects of anesthetics used in therapeutic use, the researchers said. The study determined that anesthesia-related death rates dropped by 97% since the late 1940s to early 1950s. However, according to Time, a 2011 story in the German Medical Association’s science journal states that after decades of decline, the worldwide death rate during full anesthesia had increased to approximately seven patients in every million. That’s up from four in every million at the end of the 1980s. The study said the number of deaths within a year after receiving general anesthesia is one in 20, and for those over age 65, it is one in 10, the study reported. The author of the study said the uptick was the result of an increase in the number of older patients — not reduced quality of care. Have you or a loved one suffered complications related to anesthesia? Contact us now for a free consultation. The American Society of Anesthesiologists says “anesthesia is safer than ever.” Anesthesia-related death rates have dropped from two deaths per 10,000 procedures to one death per 200,000 to 300,000 procedures, according to the organization. “To help put this into perspective, a person is about 40 times more likely to be struck by lightning than he or she is to die from anesthesia-related complications,” the association says in its Vital Heath Report 2. 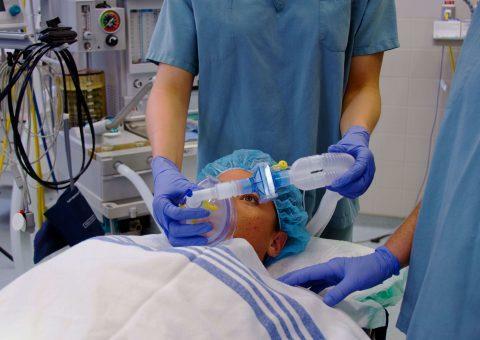 Mistakes made in the application of anesthetics can lead to serious complications, life-long medical issues and a number of associated problems. The risks associated with receiving anesthesia vary depending on the patient’s age, physiology, and the type of surgery involved. Although rare, complications may occur, including lung infections, stroke, and heart attack. Sometimes, the symptoms associated with errors in anesthesia include convulsions, bronchospasms, or an inability to breathe properly. Sometimes, death can be traced to either improper dosages — too much or too little — or medication type. Failure to properly monitor the patient or to recognize complications, mistakes in the operation of oxygen equipment, and failing to give proper instruction to the patient about eating before surgery are among the possible problems. Complications from anesthesia errors include brain damage, allergic reactions, nausea, breathing issues, stroke, nerve damage, blood clots, heart attack, medium-term mental confusion, pneumonia, and death. Some patients who are administered general anesthesia are aware of what is happening during surgery but are unable to speak out because of the numbing effects of the medication. That rarely happens, according to the American Association of Nurse Anesthetists. When it does happen, those patients sometimes experience long-term psychological issues similar to post-traumatic stress disorder, or PTSD, because they are unable to communicate to doctors that they are awake or experiencing pain. Young children also face anesthesia risks. One study found language comprehension and intelligence quotients decreased in young children who received anesthesia for surgeries.